LibreOffice 5.0 is almost here now; it will be made available for download on Auguest 5th 2015. We have been keeping eye on its updates and have been reviewing the beta releases of this product. 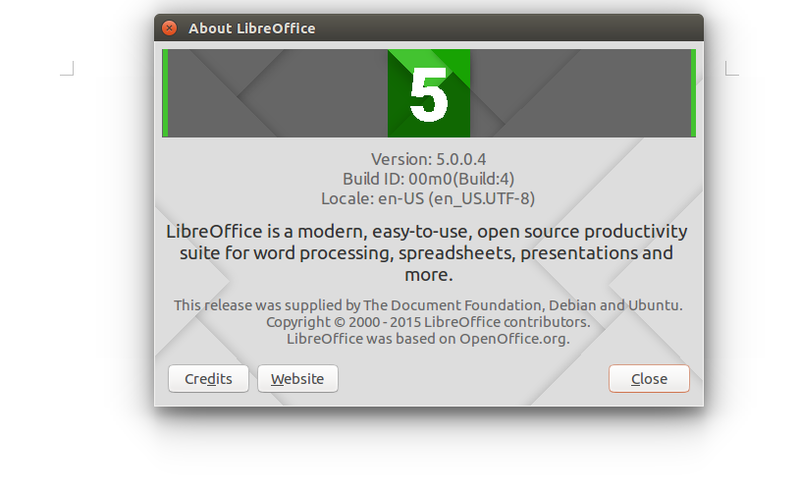 LibreOffice 5.0 is being considered to be an important version for this open source office application suite. Check out our article regarding LibreOffice 4.4.4 for more updates on the background. In this article we will be discussing the important features in new LibreOffice 5.0 release and the installation process for LibreOffice 5.0 RC. LibreOffice is a product by “The Document Foundation” , developers of this application are claiming that 5.0 is the most complex and important version of this application released so far. Here are some of the most important features of this applications, kindly note that this release has abundance of features, we have listed only few of them below. It offers MS-Word compatible text highlighting. Ability to crop and perform basic image processing operations. Better table management and calculations of page numbering. Overall revamp of toolbars and improvements to DOC, OOXML and RTF formats. Lets you apply conditional formatting to the spreadsheet documents and numerous improvements have been made to XSLX features. It supports PDF document exports. Improvements in filters and overall graphical interface. Tweaks to improve the overall functionality of HiDPI component of the application. It introduces a new icon theme, known as Breeze. LibreOffice 5.0 RC is the replica of the stable release, so you can test and use it to get familiar with LibreOffice 5.0. It is pretty easy to install 5.0 RC. Launch your terminal and run following command remove the older version for LibreOffice from your ubuntu system. Once it is complete, run following command to add PPA for LibreOffice 5.0 RC. Run following command to update the APT package manager. That’s it, we are all set to install LibreOffice 5.0 RC. Run following command to install it. Launch it from Applications menu and start using this wonderful office application suite. The upcoming LibreOffice 5.0 will be exactly the same as this RC version so you should feel no difference once the main release is out on August 5. Excited to try new LibreOffice 5.0 ? It should be a nice addition to our Linux desktop; LibreOffice has come a long way in becoming one of the best free application suites in the world. Linux users love to have such feature rich apps free of cost on their desktops.